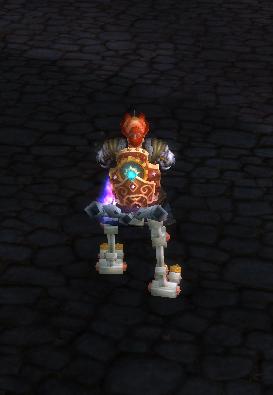 With the patch came shared mounts, with shared mounts came little gnome robo-chickens. It’s patch day. One more step closer to MoP. Or, as my Debbie Downer self would say, the day everything breaks. I did hope to sneak out early today so I could start downloading, but that doesn’t seem to be possible, so instead I will post some pics. 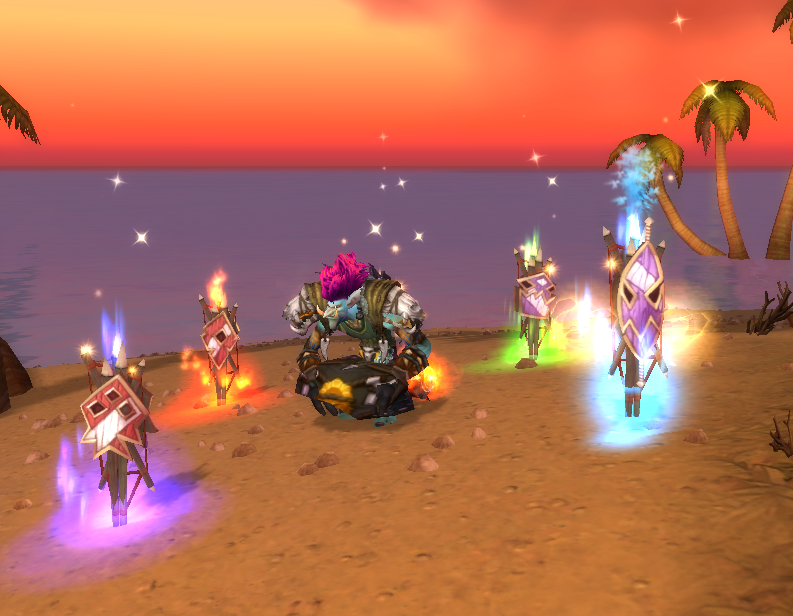 I don’t know how the new shaman totems will work going forward, but I decided to be all sentimental and play with them one last time. Goodbye Call of the Elements. I loved when you came along and I could throw all my totems down at once. No longer did I have to waste time placing them individually. And they all placed themselves in a neat little square around me. My OCD loved that. Goodbye Totemic Recall. You were cool, too, only slightly less so. I have abandoned pretty much all of my toons lately, but my poor Alliance ones definitely got the shaft. I logged onto Sarinde earlier this week to see where I had left her and it wasn’t good. She had some random low level tailoring mats and some Simple Flour in her bags. Oops, oh yeah. I had gathered all that stuff up for her for last month’s Darkmoon Faire but got bored before I could actually go and do those quests. Even more sad is that Sarinde is still one point away from being maxed in tailoring. My Horde toons are set pretty well for MoP. They are basically just sitting around waiting for the patch to break everything and send them into chaos. But I still had some things to take care of Alliance side. The biggest gap I had with those toons is that none of them was a jewelcrafter. This wasn’t really a problem until Khiaren started doing some raiding over there and regularly needed gems. If I couldn’t find someone on at the time, I had to resort to the AH. And the gem market on Winterhoof was insane; I was hoping an Ahmule would show up and fix it. I guess all it took was some pre-patch boredom to get things going. Because what do I like to do when I’m bored? Make another alt! My wonky logic then told me that pandas can’t be DKs, so I could make one of those and not feel like I was cheating myself out of something I could do when MoP hit. Plus, of course, I could skip 50+ levels by going DK. The plan isn’t to be maxed by MoP, but just to get as much done as I can. With my DK plan in place, I just needed to choose a race. To avoid repeating what I had I eliminated female human, female draenei, dwarfs, and female worgen. My previous JC-turned-bank-alt was male draenei, so I knocked that out, too. I could not farm ore with that ridiculous habit they have of looking over their shoulder. Why so suspicious? I was left with male human, night elf and male worgen. I played around on the preview screen for each one and all of them were kind of meh. I kind of liked female night elf the best, even though several runs of Well of Eternity kind of made me hate their animations. But this was not a caster, so let’s try it out. A few quests in and I was bored. I didn’t really like her and didn’t want to continue on. So I decided to break my duplicate rule (for the second time: see Sabryel & Notari) and go with a race I already liked. Ok, I liked the waggle of the female draenei. And they come with a JC bonus. Fine, I won’t have duplicates of toons unless one is a DK. Does that work? Since you get spit out of the DK starting zone at 58, the plan was to head to Outland, get to 60 and grab flying, then go back and work on farming ore and leveling up the professions. 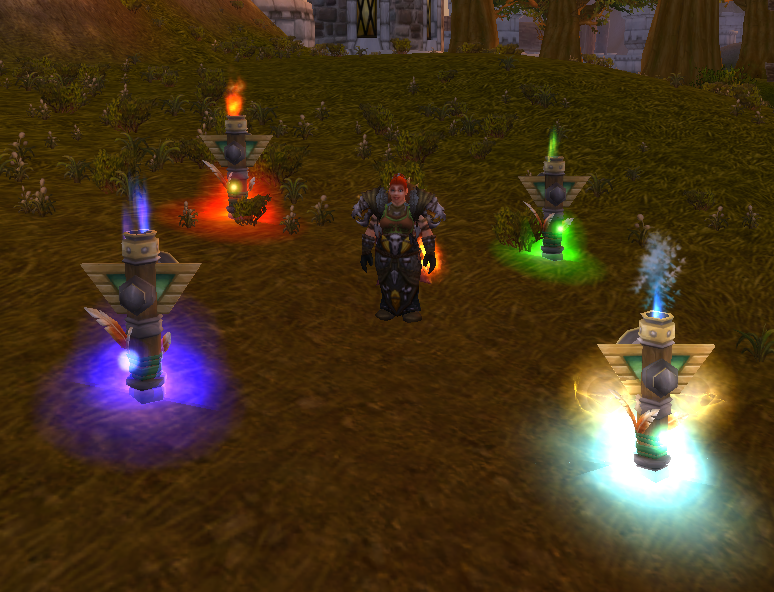 But then I hit 60, picked up flying…..and continued questing. Playing melee in a group setting is still not my favorite thing, but I do enjoy bashing things in the face when I am soloing. I kind of forgot how fun it was to feel so OP as I go along doing my quests. (Yes, I know they basically defanged any elite not named Fel Reaver.) I couldn’t stop doing quests! So I ended the weekend with my DK at level 63 and mining at level 1. Jewelcrafting would be at level 1, too, if it wasn’t for the racial. I have spent the last two weeks being forced to actually go into the office. Waking up early, putting on clothes, the horror! All for the joy of learning the new system we will be using. During my 8000 hours of commuting free time, I amused myself with how similar learning a new work system is to the upcoming MoP for WoW. Both will be supposedly easier and better after the initial learning curve has passed. My new work system will allow me to do my job faster while MoP will give me Pokemon battles. What worries me about both is the ramp-up period. In my old work system and in Cata, it may not be pretty or the most efficient, but I have the experience there to get to what I need and get things done. Even if I can see the benefits of what’s coming up, I still cling a little bit to the old way because that is what I know. I know from previous expansions that the first couple of days are kind of ugly. A big reason for that is broken add-ons. It would be a nice, fairytale land if I didn’t need to depend on add-ons, but in the ugly real world I do and I miss them until they are updated or I find something comparable. But, I do know that once you get over that initial hump of frustration and feeling lost, eventually all the new stuff starts to feel like second nature. Even later on I know I will be wondering what I was so worried about and how it was that I ever got things done the old way. So while it is daunting now to have two big changes coming at roughly the same time, I can use the experience of one to remind myself that in the end, everything will work out. And soon I will be posting how bored I am of MoP and when is that next expansion supposed to be out?